The traditional four year anniversary present is flowers and fruit. 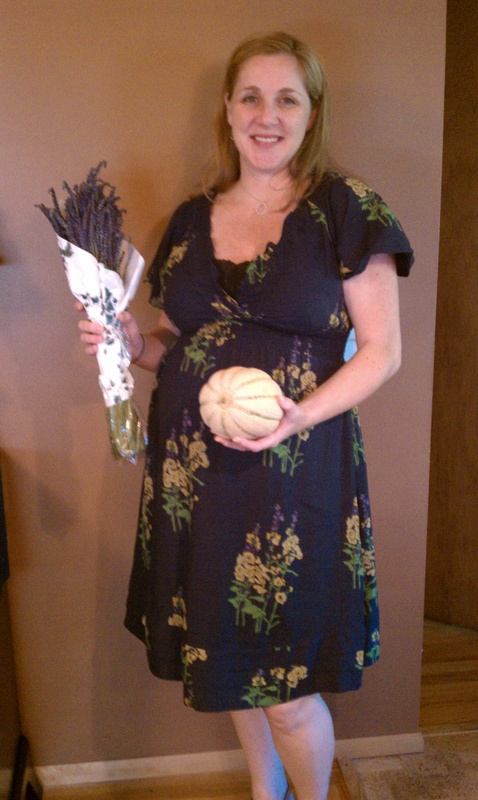 The lavender from the area (mostly from the olympic peninsula) has hit all of the stores. And the fruit? Good gracious, the fruit is so incredible right now. I’ve been going through about two cantaloupes a week. It’s good nurturing for my lil cantaloupe (actually, he’s a head of lettuce this week – I never knew heads of lettuce were so bouncy) and it tastes so good. By far, that is the #1 bonus of being pregnant in the summer. You have to really up your game on fresh produce. The fresh produce also ups it’s game for you. Win win. My beau picked me up last night for our 4 year anniversary date with a tuscan melon and some rich smelling lavender. How sweet is he? It’s been an awesome four years. Here’s to many, many more! I’d heard some buzz about this about a year ago and just kind of blew it off. But I’ve been starting my morning conference calls ridiculously early lately and seem to stop finding time for a healthful breakfast. 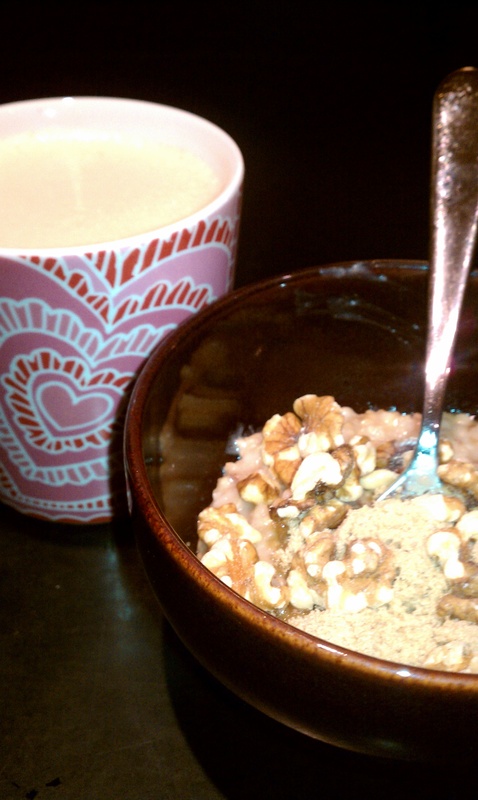 Last night, I decided to give this whole crockpot oatmeal a whirl. I love the idea of oatmeal, always have. But in execution, I get squeamish about it being slimy. Or crunchy. Or just bleh. Scott loves to make steel cut oats on the weekend, but they take about an hour to prepare — and who has that kind of time? And really? I still don’t love them. Even topped with tons of brown sugar. Anyway, I gave this recipe a go in an attempt to give myself some heart healthy, nutrient rich breakfasts this week. The little growing one would sure appreciate that over the Lemon Snickerdoodles that call my name around 10am. The key to making this not crunchy nasty is sort of a double boiler effect! Mix all of the ingredients together in a bowl that will fit inside your crockpot. Place bowl inside crockpot bowl and pour water around it (I started with some water already in the crockpot so I didn’t have to add too much and risk a spill into the oatmeal bowl). The water should come as close to the rim of the oatmeal bowl as possible. Place on low for 7-8 hours. Have delicious breakfast when you wake up and be fueled for the day! ready for the day now! Result? I loved it. It’s actually the best oatmeal I’ve ever had (except maybe the oatmeal at the Sheraton breakfast buffet in Anchorage, AK – yes, totally random. It could be because I always got reindeer sausage to go with it too?). I topped mine with a spoonful of brown sugar and tons of raw walnuts. Scott just sprinkled walnuts on his and also loved his. It was excellent! I will definitely put this in the routine for weekday breakfasts! Somehow every time I go home, I still feel like a kid. I revert into some of my old habits, I respond to different situations like I did when I was a kid. (I am SO NOT dramatic in real life now. Right? Scott?) Ok, whatever. I still feel like a kid when I go home. Mom & Dad have a way of making their grown adult children still feel special and loved and comfortable like we never moved out. 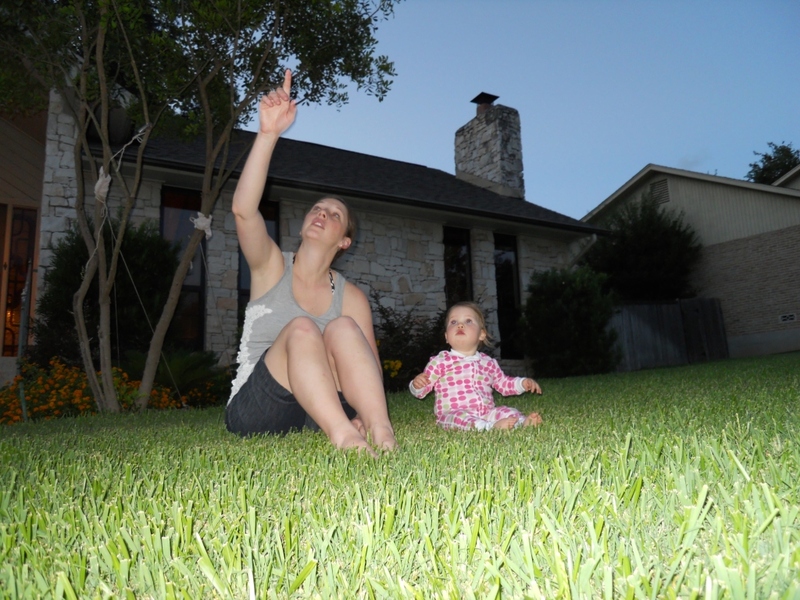 I took one last trip down to San Antonio sans kid and enjoyed the freedom of just relaxing and playing with other babies and handing them off to mama when they melted down. We got to celebrate Piper’s first birthday. 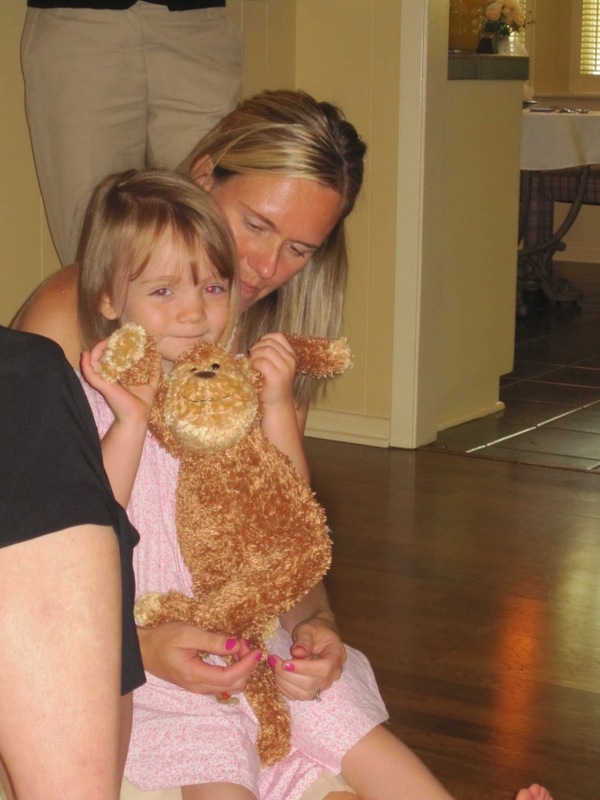 It’s so hard to believe that girl is already 1 and Katie is just around the corner! Both of them have changed so much in the short time since I saw them last and Abby is just a grown up little girl with excellent manners. I can’t get enough of those three. Piper got some really neat music toys from her Aunt Sharla and Cousins. 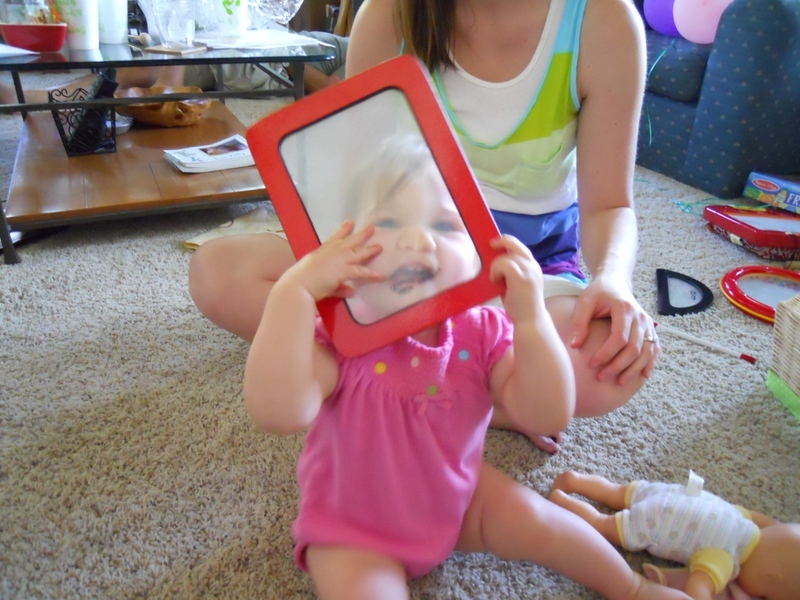 She loves to look through the transparent ones and grin at you. Pictures are hard to catch, but I managed one decent one. 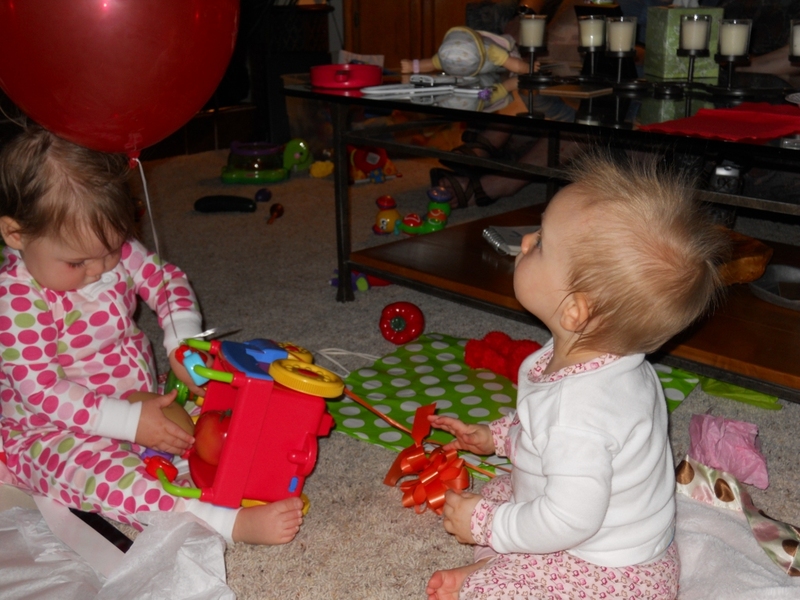 She and Katie were quite preoccupied with the balloon and sort of “fought” over it for a few hours. It’s tied to the truck Piper is playing with and Katie’s trying to figure out how to get her hands on it here. She’s quite savvy. will she notice if i take the balloon? 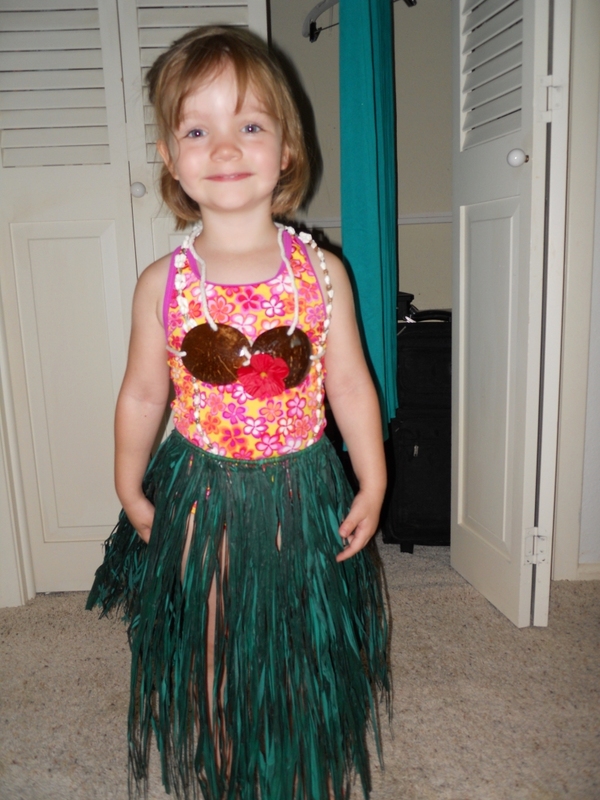 We brought back little Hawaiian hula girl outfit for our older nieces (Miss Maddie has one too). Abby decided to do a little modeling show for us. She got shy and wouldn’t do a hula dance for us though. We spent a little evening time out on the front yard waving goodbye to Jake, Shar, Katie & Abby and Piper kept saying “moon” over and over again. She got a quick astronomy lesson from her momma. The other reason I came to town is because my dear, sweet friends threw a little get together to honor the impending arrival of baby Lpod! 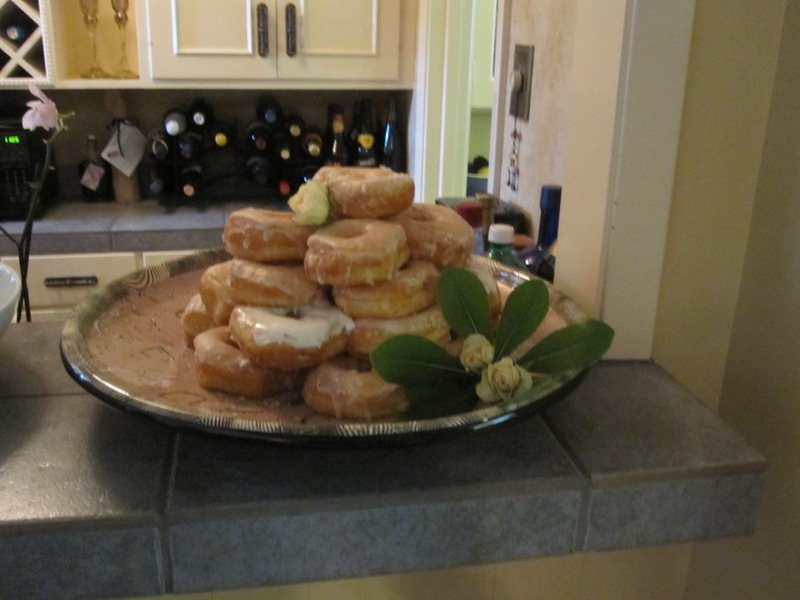 Embarrassingly, the very first thing I smelled/noticed when I walked in the door was donuts. Someone figured out my Shipley’s craving. Don’t tell anyone that I had four donuts that day. I couldn’t help it. I should open a Shipley’s here so I don’t have such horrible splurges. Goodness, they make a good donut! 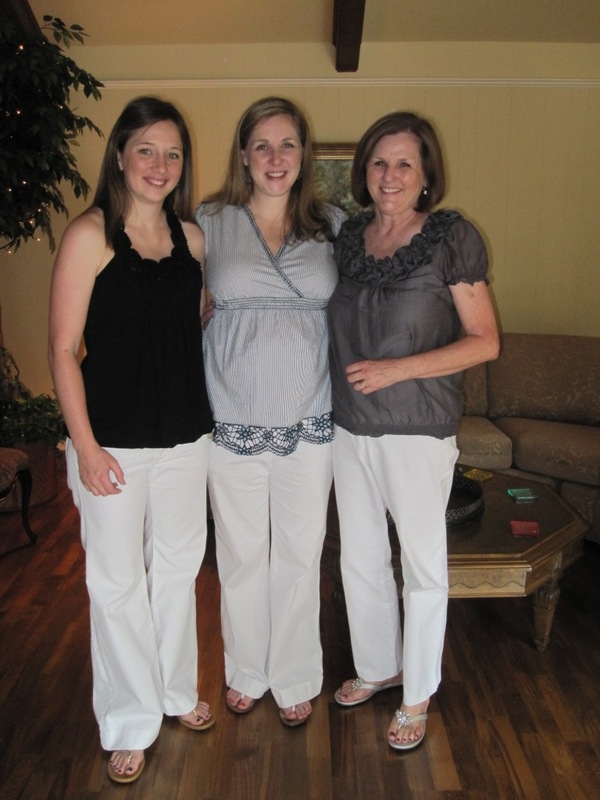 Mom, Mel and I all got ready together at Mom’s house and when we walked out, realized we were all wearing white pants! Jessica and I used to call each other in the morning before school to plan our outfits to match. I promise I did not text Melissa from upstairs and tell her to wear white pants! 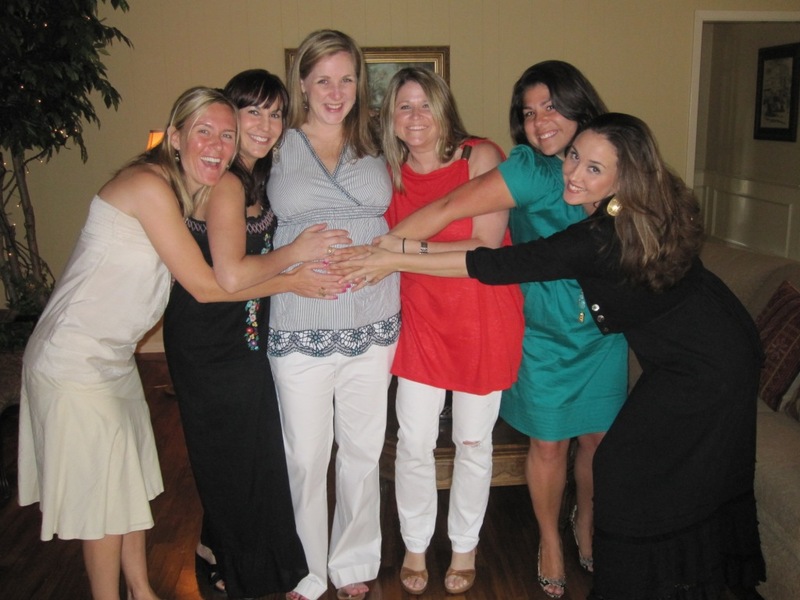 So many people who have been a part of my life for decades joined in to celebrate the baby. It was so nice of them to come and shower us with fun things for the nursery. These women are amazing, it’s like I have many moms (I don’t think I used the word amazing in high school, but we can all laugh about that now :)). Abigail took to some of Baby Oliver’s toys right away. She was introducing the monkey to Allisony. allison telling abby stories about her aunt? 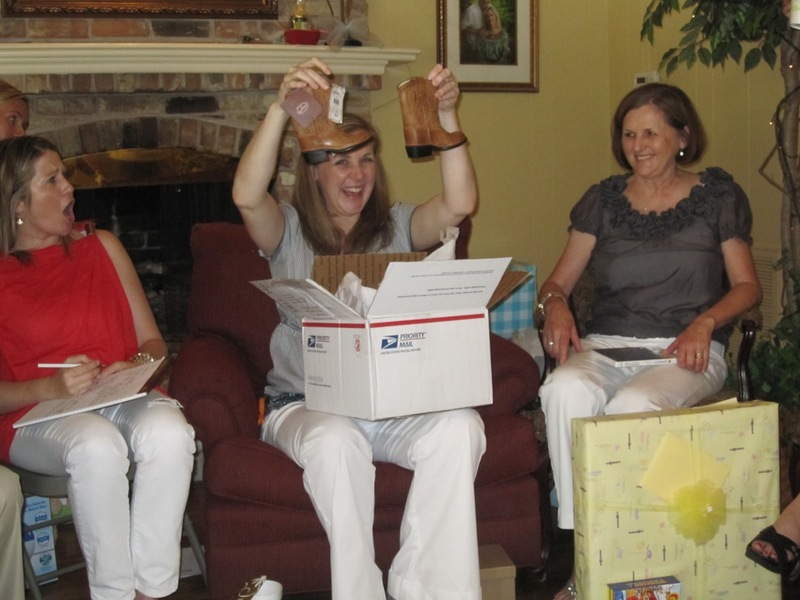 Mimi & Poppop made sure that this kid will know his roots and gave him his first pair of cowboy boots! Yes. I cried when I opened them. They are so stinking cute. 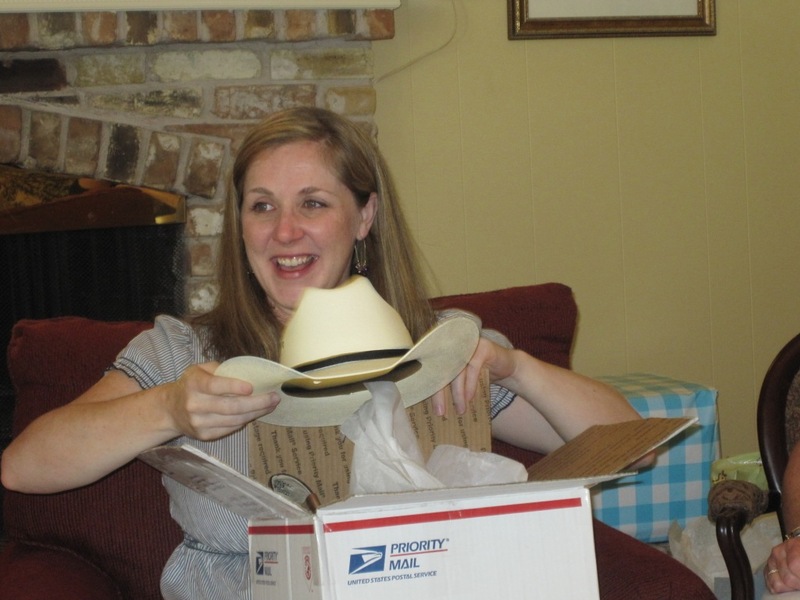 And what good are boots without the hat? Such a cool gift! My sweet friends showered me with such a fun party. 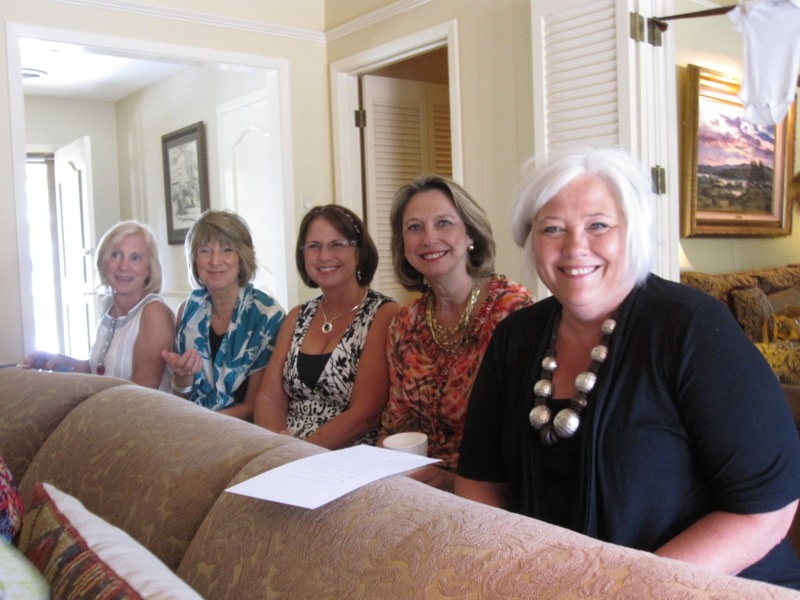 I’m so blessed to have these women in my life – most of which I’ve known for 30 years. I only hope our children have friends that will cherish the friendships formed in pre-school and love each other through life – even if we are more than two thousand miles away. Who knows, maybe we as parents can be as loving, supportive, and nurturing as our big group of moms and dads? I don’t know. Those are some really big shoes to fill. Love you guys, thank you for blessing our new little family.